If you are seeking a fresh new look for your home or business, planning on selling your property, or just needing some basic maintenance, contact MNPro Painting Services in Andover, Minnesota. 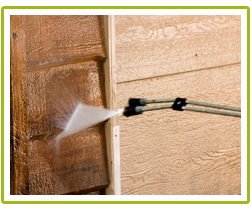 We provide exterior painting and pressure washing services throughout the Twin Cities metro area & surrounding suburbs. MNPro Painting Services helps you add aesthetic and monetary value to your property with its exterior painting services. Our company takes care of all of the preparation and cleanup work. We evaluate your home or business for any rotting boards and recommend replacement before starting, if necessary. Our team pays special attention to power washing the exterior to ensure a smooth finish of any pillars, shutters, and trim around windows and doors. Maybe you don't need any painting, but still want to give the exterior of your home a good refresher. For this reason, we also provide pressure washing services. Mold and dirt left untreated is a harbinger of diseases and bacteria, and can lead to the deterioration of decks, fences, and any other surfaces. Your schedule is important to us, which is why you can always expect that we'll finish your job on time. We hope that you're so happy with our service, that you'll also consider our team to paint your interior. Contact us today for a free bid.